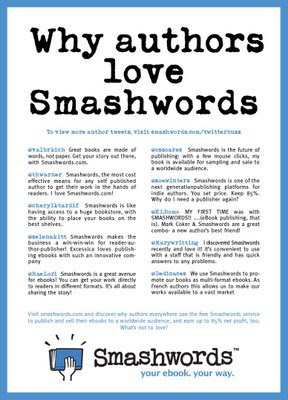 After almost 24 hours of nail biting suspense, today we're unveiling the Smashwords Writer's Digest Twitter Ad (click on the image at left). I'm wondering if it's one of the first print ads ever written with Tweets. Rather than writing our own ad, we let our enthusiastic authors, publishers and readers write the ad for us. We decided at the last minute (24 hours before the ad was due to ship to the printer!) to invite Smashwords fans on Twitter to tweet why they loved Smashwords. We limited the competition to about 18 hours (only because we didn't have more time), and by the cut-off time of 9am Pacific Tuesday, we had over 100 very cool tweets. I then selected my favorite 10 and we popped them in the ad and sent it off to Writer's Digest. The full page ad will appear on the back cover of the upcoming special novel-writing issue of Writer's Digest, scheduled to hit newstands in early July. For each of the 10 winners, they'll get valuable publicity in front of Writer's Digest's 100,000+ subscribers. The ad itself also came together quickly, thanks to the great work of David Gee, a professional ad copywriter and book cover designer out of Toronto. Dave took my original ad concept and made it 10X better. My original idea was to do a traditional ad with a lot of copy (because we had a lot of benefits to communicate!) and combine it with a few Tweeted testimonials. After some discussion with Dave and Lesleyann (Mrs. Smashwords), we decided to let the tweets speak for themselves. As the tweets came in, we changed the headline to match the theme of the tweets. So there you have it. Like all good things in life, one unexpected development can lead to another. While the 18 hour contest was under way, I heard from one entrant who noticed that thanks to her participation in the twitter promotion, other Smashwords contestants started following her on Twitter (people were doing searches on Twitter for "Smashwords" to read all the fun entries). So not only were folks participating in the competition, but community was forming among the participants. That got me thinking that there would be value in helping to showcase the winners online in such a way that they could better connect with others, and in the process build greater followings, new friends, and ultimately greater exposure for their books at Smashwords. As I cut and cut to get to the final top 10 (it was painful to cut so many great tweets! ), I started wondering how we could preserve the other great tweets, and this led to the creation in the last 24 hours (thanks to the pixie dust programming wizardry of Bill Kendrick, our CTO) to Smashwords Twitterbuzz. And again, as so often happens with my hyperkinetic thought process, what started as a simple idea of showcasing the dropped tweets morphed into something bigger, then bigger again. First, we extended Twitterbuzz so future tweeters could tweet additional testimonials. Then we created a Twitter directory of Smashwords authors, publishers and readers. Then we integrated everything within the Smashwords environment, so you can easily view the Twitterer's Smashwords bio, their profile page at Smashwords, and their most recently published book. And then we added a live feed of Smashwords-related tweets on Twitter. So Smashwords Twitterbuzz is actually a collection of three twitterific mashups between Smashwords and Twitter. All with the goal of helping eBookish people connect in a meaningful way. Check out Twitterbuzz and let us know what you think. At the top of every page at Smashwords is a link where you can provide feedback. Let us know how we make this tool more valuable to authors, publishers and readers! And of course, if you want your own tweets included in Twitterbuzz, click to the Twitterbuzz page. Now, on to the other 100+ items on our development roadmap. Well done, Mark - your passion is why smashwords works so well. Great ideas all round!